Each week, Highland Woodworking holds a variety of woodworking classes including offerings in turning, carving, finishing, woodworking basics, and many more in our Tage Frid Seminar room. We have been offering these classes for more than 35 years and have hosted some of the greatest woodworking masters around, including Roy Underhill, Tage Frid, Sam Maloof, and Dale Nish. With our ‘Hands-On’ workshops, students are able to get one-on-one time with the instructor who helps them begin to master the skills they need to start or continue working in their own shop. This past month, woodturner Hal Simmons taught a Beginning Woodturning class, which consisted of morning instruction followed by hands-on practice by the students. Students learned the basics of the different woodturning tools and construction methods and were then able to to turn a variety of items including spinning tops, a carver’s mallet, honey dippers, and other small projects. 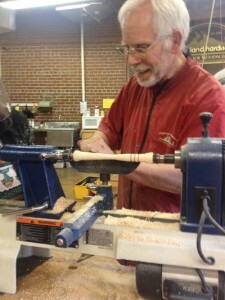 CLICK HERE to see the photo gallery from our Beginning Turning class. CLICK HERE to see our current class listings and to sign up!